Gold Cross Pendant in 14K Two Tone Gold . 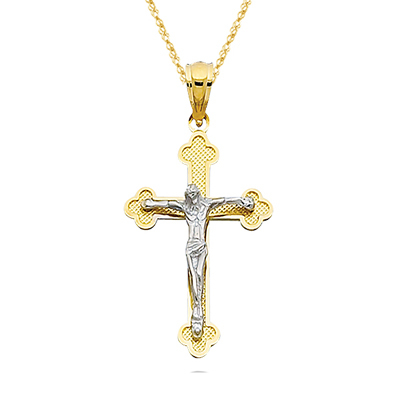 This luminous Two Tone Gold Cross Pendant showcases Jesus in 14K White Gold, bejeweled in 14K Yellow Gold. The pendant comes finished with an 18-inch 14K Yellow Gold Singapore Chain. God cares those, who takes care of themselves.